The CF (Compact Flash) based SCSIFLASH Network drive provides a solid state, drop-in replacement for SCSI hard drives, SCSI SSD drives, SCSI Magneto Optic, SCSI Floppy, SCSI PC Cards, SCSI PCMCIA cards and SCSI Zip drives whilst also offering network (ethernet-based) back-up and restore capability. No additional software or register changes are required to the legacy host. Custom capacities available for systems that require exact capacity value. Custom sector sizes available. The Solid State SCSIFlash™ back-up and restore capability enables vital data back-ups to be made as a complete disk image of its CompactFlash card at any given point in time and transferred via an Ethernet network to be stored remotely from the legacy equipment and restored as and if needed. Universal TCP is used for disk image transfers with remote execution of back-up and restore configuration operations controlled via the onboard Windows GUI, or user API /CLI and auto-online implemented on back-up completion. The Compact Flash (CF) SCSI-Flash Ethernet back-up and restore capability generates considerable savings in time and expense in the face of process outages. In semiconductor manufacturing, for example, process outages can cost in excess of $1,000/$100,000 per hour/day. In the telecommunications industry they may incur considerable fines. The SCSI-Flash Ethernet back-up and restore capability can also be used to replace traditional manual rotation of media with remote download of manufacturing files so that, for example, a CNC machine knows what program to run for a particular session or a semiconductor fab which recipe to use. 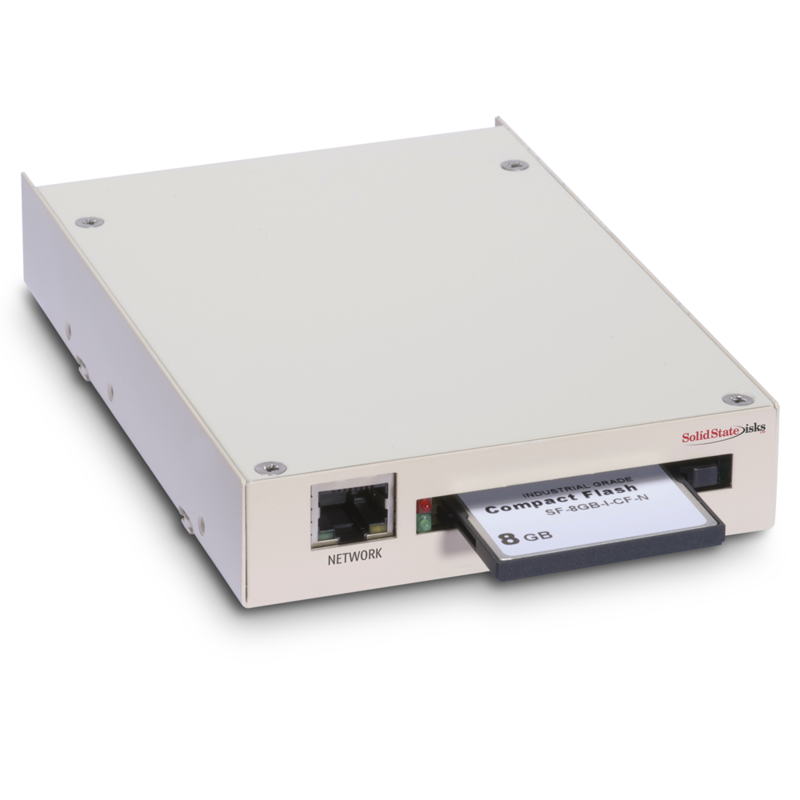 The SCSI-Flash emulator drive is a completely programmable replacement solution, enabling the SCSI device implementation nuances of all equipment manufacturers to be fully emulated. SCSI-Flash combines proven SCSI drive architectures (SASI, SCSI-1, SCSI-2) with industry-standard, solid state CompactFlash card technology to provide a high-reliability, solid state replacement for any style of SCSI-based drive including hard disk, magneto optical, tape and floppy drives. The SCSI-Flash drive supports CompactFlash cards up to 64GB and utilizes a 3.5 inch form factor (or larger 5.25 inch form factor). It is available in two package types either with or without an externally removable card. The SCSFlash network drive replaces the existing legacy SCSI drives ( hard disk drives and Magneto optic drives) used for both telecommunication switches for the existing billing system and data archiving. The emulator does not require changes in the telco host system. The emulator can be used as part of the automated billing system and archiving system data and control through the use of onboard GUI and API interface. Legacy semiconductor manufacturing hosts systems include: HP1000, HP9000 C1537, C1539 (B180L and B2600), HP UNIX HPUX9, HPUX10, AMAT (Applied Materials) P5000 / P5200, P5500, RTP, Endura, Centura, Canon FPS-3000, Canon FPS-5000, Canon B2000 / B2600,TSK, Tokyo Electron, TEL, LAM RESEARCH (CLASSIC, ENVISION) KLA, ASM EPI, KS, and DISCO. Legacy industrial process control host systems include: IRMX86, HP1000A, HP9000, 12016A, VAX, uVAX using RWZ01, RZ23, RZ28, RZ29 SCSI drives, Rosemount RS3, Honeywell Measurex TDC 2000 / TDC 3000 universal station on MX open and VX works, Thor VX8 & VX9, WDA History Module, Honeywell SBHM (Single Board History Module). Legacy engineering and manufacturing hosts systems include: IRMX86, HP1000A, HP9000, 12016A, VAX, uVAX using RWZ01, RZ23, RZ28, RZ29 SCSI Drives, Rosemount RS3, Unipro90, Honeywell Measurex TDC 2000 / TDC 3000 universal station on MX open and VX works. Power generationhosts systems include: HP1000A, HP9000, 12016A, DEC VAX, uVAX using RWZ01, RZ23, RZ28, RZ29 SCSI HDD and Rosemount RS3. Legacy oil and gas production host systems include:IRMX86, HP1000A, HP9000, 12016A, VAX, uVAX using RWZ01, RZ23, RZ28, RZ29 SCSI Drives, Rosemount RS3, Honeywell Measurex TDC 2000 / TDC 3000 universal station on MX open and VX works. Legacy mil/aero equipment host systems include: Miltope, Thompson CSF, Dutch Signaal, OMTI, Solaris SUN SPARC/CPU-8VT, Iomega Bernoulli, IBM AS400 and RS6000. Examples of legacy simulator hosts systems include: Encore, Gould, 320 C2000 sim and Evans & Sutherland.